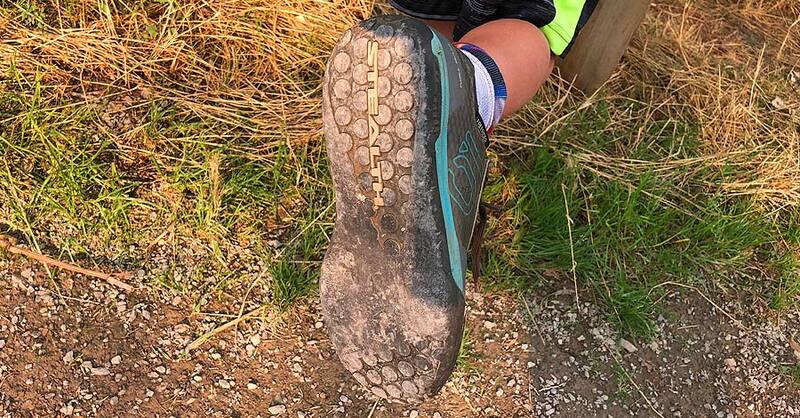 We were excited to get a pair of the Five Ten Freerider Contact shoes. Why? 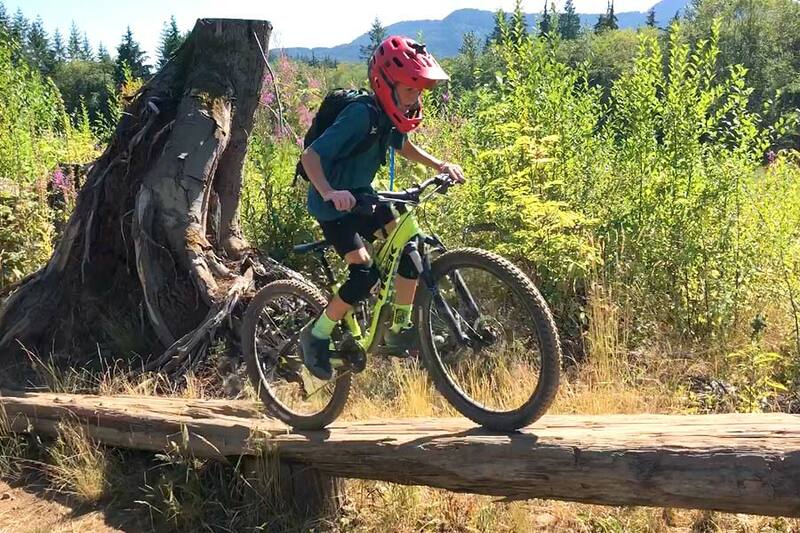 Simply because when our kids grow out of their mountain biking shoes, it induces quite a bit less wallet trauma versus growing out of a bike. Our eleven year-old’s last pair of Five Ten Freeriders served him well and we really wanted to get another pair. But, we needed a new pair of Freeriders quickly – and we could not get the same style in a larger size locally. 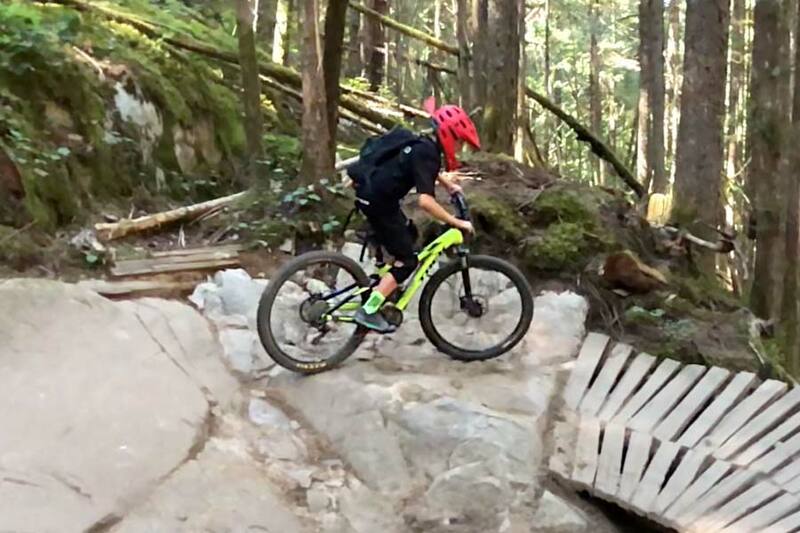 In a jam, we glady paid the retail cost of $150.00 (for a women’s size 6 which is about a 3.5 kids’ size) because we are well familiar with the quality of Five Ten mountain biking shoes. These shoes will not fall apart. Our kid will outgrow them and we can sell them used. Although they’re designed and marketed towards women, our boy doesn’t give a single shift click about that. Even I think they look cool. And, after trying on a few pairs, these were going to be a good solution for the season. 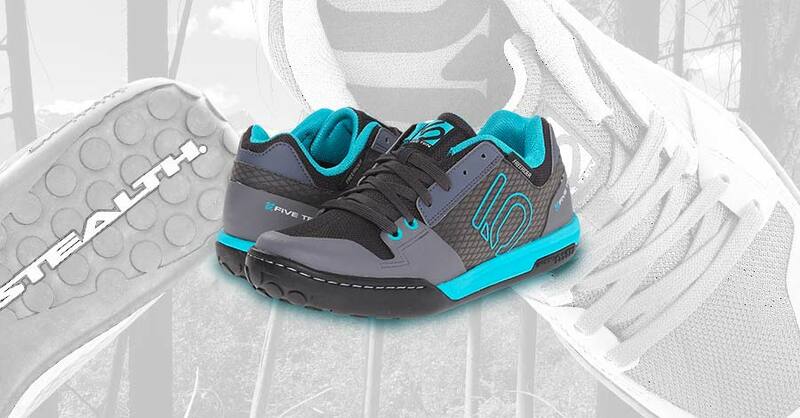 The Five Ten Freerider Contact has a smooth outsole where the ball of your foot will be on the pedals. Five Ten states this is to prevent slippage. However, the entire sole isn’t covered in this texture – the parts that are located under the heel and toe have a more traditional pattern. Kind of like the first-gen Freeriders. The entire sole is made of that wonderful Stealth® Mi6™ rubber. 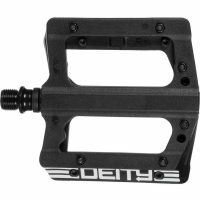 This translates into a shoe designed solely (no pun intended) for serious and hobby mountain bikers alike. Who likes high performance and great-looking mtb shoes? These are starting to break-in nicely. Do you agree? Do not wear these shoes with inexpensive flat plastic pedals. They will slip right off and render the shoe useless. You have to pair these shoes with flat pedals featuring small metal pins extending from the pedal surfaces. 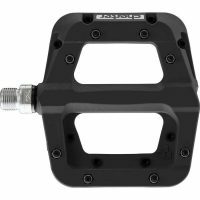 There are examples of these recommended pedals above. This allows the surface of the shoe to almost absorb the pins and make a firm connection with the pedals. 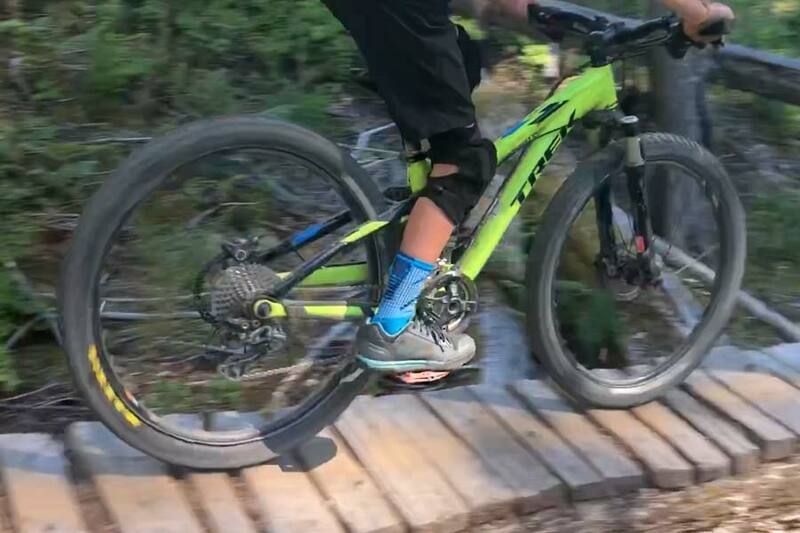 You have to be careful though, when your young one slips and takes a pinned pedal to the shin, it will cut their shin, bleed, and effing hurt. Ye’ve been warned. Our test rider rode his bike hard for 14 days straight on some demanding terrain. He did not slip a pedal or complain about foot discomfort. We can’t guarantee the same results for your womp rat, but mom and dad were glad that this was not a concern. Handling a tough technical turn with ease. That Stealth rubber grip, tho! Not slipping a pedal is important. The entire profile of the shoe is low. The toe cap is rubberized to provide protection. The entire upper section of the shoe is made of breathable and durable synthetic fabric with mesh sections to let in air. That fabric is also abrasion resistant. 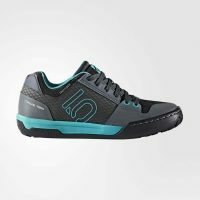 A stiff, yet bendable compression-molded EVA (Ethylene Vinyl Acetate) material composes the midsole of the Five Ten Freerider Contact. It protects the bottom of the foot from the pedal. At the same time, it’s very easy to walk in these shoes, thanks to the somewhat bendable nature of the EVA. 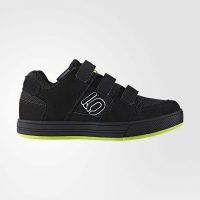 Overall, the Five Ten Freerider Contact mountain biking shoes are great for riders of all ages. Our youngest really likes his. 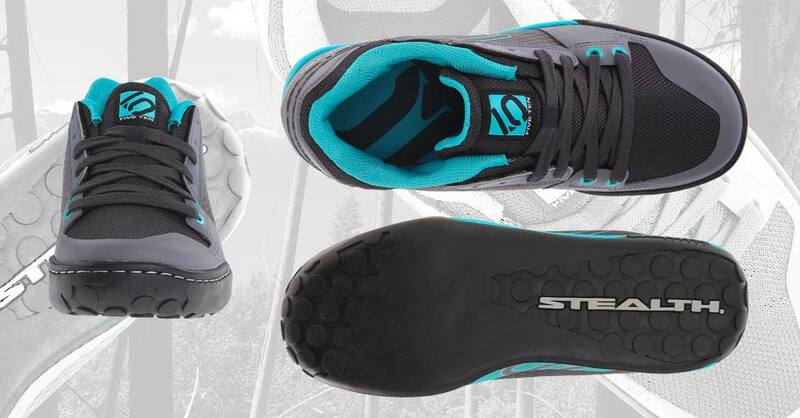 Their unique outsole is purpose built for mountain biking and that super sweet Five Ten Stealth rubber helps keeps your feet from slipping off the pedals. With that said, they are keenly designed and comfortable enough for doing a bit of hike-a-bike on.